Jewellery stocks continued to remain under pressure for the second day in a row, amid concerns that restrictions by the Reserve Bank of India on gold imports would impact the sector's growth. After the notification, stocks from this space have seen a lot of unwinding. Tribhovandas Bhimji Zaveri has dipped almost 21 per cent in two days to Rs 194, followed by Shree Ganesh Jewellery House (down 13 per cent to Rs 81.55), PC Jeweller (down 12 per cent to Rs 101) and Gitanjali Gems (down five per cent to Rs 530). Image: A customer looks in a mirror after wearing a gold earring inside a jewellery shop in Hyderabad. The BSE consumer durables index, in which the jewellery sector has a combined weightage of about 70 per cent, is the largest loser among sectoral indices, slipping 13.3 per cent in two days as compared to a 2.1 per cent fall in the benchmark S&P BSE Sensex. Titan Industries, currently trading at its lowest level since February 2012, has plunged 23 per cent after the company said RBI had clarified all import of gold for domestic consumption, either through banks, nominated agencies or directly, could be made only with 100 per cent cash margin. Image: A customer looks at a gold pendent inside a jewellery showroom in Mumbai. These notifications would change Titan's financial model, as its gold on lease model would cease and it would have to entirely self-fund its gold requirements, analysts say. Most jewellers source gold either as outright purchase (held as inventory) or lease it from nominated agencies (14 banks as identified by RBI). The usual inventory holding period ranges from 100 days to 150 days, says an India Ratings and Research report on the sector. Image: A salesman arranges gold necklaces at a jewellery showroom in Chennai. "Retail jewellers lease gold from banks for 180 days against a collateral placed at an interest rate of 3.5-4 per cent (primarily linked to the international gold leasing interest rates), usually lower than the interest rates on rupee loans to purchase the gold outright. "The price of leased gold is open-ended and the cost of gold is fixed at the time of sale of gold or jewellery to the customer. "This enables retail jewellers to lower the inventory risk. It also provides a cushion when prices fall and keeps the inventory loss restricted to the extent of the gold taken on lease," it adds. Image: Salespeople are reflected in a mirror as they stand at the cash counter inside a jewellery showroom in Kochi. "Titan would no more enjoy a perfect hedge, as it would source gold on cash and even with the best hedging mechanism, it would carry some risk on gold exposure," said an analyst at Emkay Global Financial Services. Adding: "As a result, the company would have to use up its entire cash for funding this. It might also have to resort to debt if its cash is inadequate to fund its sourcing needs." Given the sliding rupee and the widening current account deficit, where gold plays an important role, analysts recommend stricter measures on import of the yellow metal. Image: An employee counts money, as a child lies on the counter, following purchases of gold jewellery inside a showroom in Mumbai. "With India's long-term challenge of the trade deficit unlikely to be overcome in the short term, we believe the government needs to adopt harsher measures to reduce imports of gold, an unproductive asset," says Sanjeev Prasad, senior executive director & co-head, Kotak Institutional Equities. "We believe the government should immediately impose a four to six per cent domestic transaction tax on gold and reduce the limit of gold purchases through cash to Rs 50,000 from the current Rs 500,000." 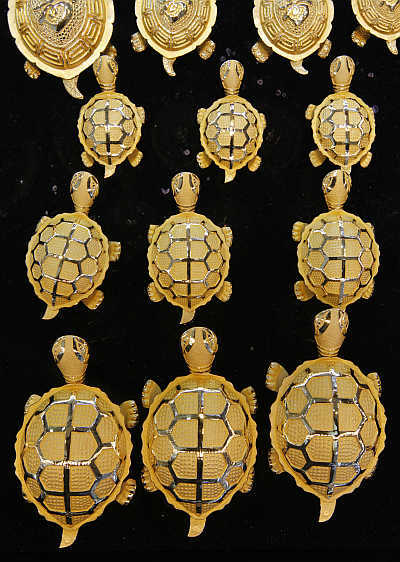 Image: Gold turtles are displayed at a jewellery shop. Jagannadham Thunuguntla, head of research at SMC Global Securities, suggests that the good times for jewellery stocks are over. Says A K Prabhakar, senior vice-president, equity research, at Anand Rathi: "There are fears that the government would act more to reduce gold import. In such a scenario, it would be wise to wait and buy Titan at lower levels. "However, I would avoid the other stocks from this space." 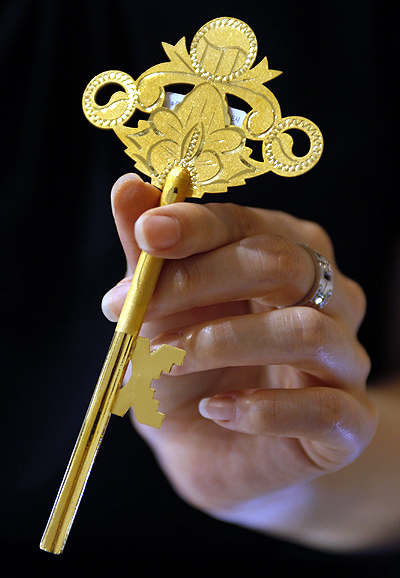 Image: An employee holds a gold key during a photo opportunity at a jewellery shop.